When moving to cleaner beauty, one of the toughest moves is fragrance. Because in the real world, the word fragrance has been stained to equal chemicals. 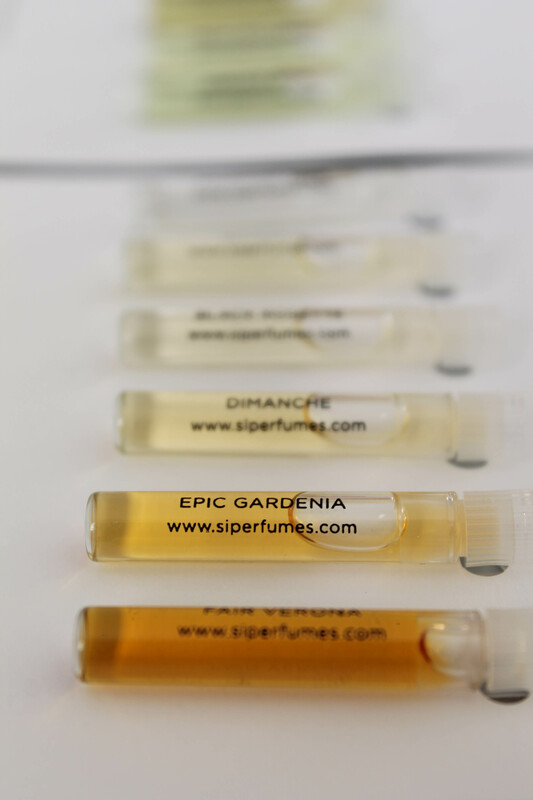 Today, let’s talk about a company that carefully sources their natural, organic ingredients and produces some of the best smelling, if not the best, botanical perfumes in the country: Strange Invisible Perfumes. As much as I don’t want to sound like I’m some “guru”, I’m going to: when I started my journey into cleaner beauty, my quick and easy way to judge a product was this. If it listed “fragrance” as an ingredient, I instantly put it down. Because fragrance basically means chemical warfare nowadays, it was tough even finding a perfume brand that wasn’t made in a laboratory out of bits and pieces of harmful chemicals. And with fragrance as the new second hand smoke….it’s time to make a switch. In my research, I stumbled upon Strange Invisible Perfumes and contacted them to learn more about the brand, the perfume maker, and more. 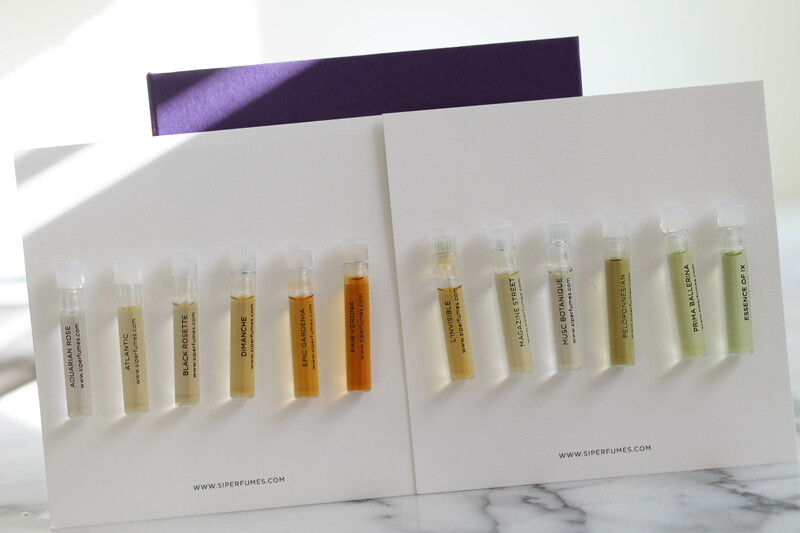 Along came a “perfume minibar” – a collection of their twelve scents, so you can try them all before making a commitment. The Perfume Minibar brings the fragrance bar of the Strange Invisible Perfumes Boutique to your door. This beautifully presented, hand-made, gold-engraved purple box includes a sampling of the Signature Collection, so that you can experience a variety of botanical fragrances before choosing a favorite. Included with each Minibar is a $50 Gift Card, redeemable against a future Signature Collection 50ml or 100ml purchase. It’s a luxurious experience for sure, at $90 per box, but when you smell these perfumes, you’ll understand why it’s worth it. And let me just state, I was not swayed by the free samples. These perfumes honestly smell like the most amazing combinations, incredibly hard to describe but I’ll try. Every single time I wear one, I get compliments on how amazing I smell! The botanical blends are certified organic, wildcrafted, biodynamic, and hydro-distilled essences. Every blend is designed, decanted, and bottled in their fragrance house in Venice, California by a master distiller that leads the team. The blends are then set into a custom-distilled cognac and aged for a minimum of six months. They commission a twelfth-generation master distiller in Napa Valley to produce this premium spirit from non-GMO, pesticide-free grapes. Basically, it’s like they are making a fine spirit every time. But let’s get to it, which were my favorite? Read below and treat yourself to sample this perfume minibar – the only problem will be if you fall in love with the most expensive one, like I did! Essence of IX: smelling this perfume instantly lifted my mood – instantly! The combination of white sage, hydro-distilled rose, black currant, lavender, French oak, and wild honey. Somehow this combination creates a botanical blend that lifts your spirits – unlike anything else! Aquarian Rose: Strange Invisible Perfumes also make blends for the zodiac sings, and let me tell you – I’m not one to read my horoscope, ever. But one smell of this Aquarian Rose and I was in love – is it because I’m an Aquarius and am attracted to this blend subconsciously? The blend is hydro-distilled rose, orange, marjoram & sandalwood – a bit woodsy, which I loved. Order the perfume minibar – I’m not making any money saying that, I am saying it because it will change your life and the way you look at perfumes. And if a product can instantly lift my mood, I’m all about it. Be well and take care of your skin! Disclosure: This post features products received for editorial consideration.